Depend Underwear for Men Maximum Absorbency have a better fit for a man’s body. 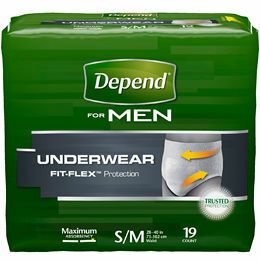 The makers of Depend understand fit is crucial for protection from leaks and accidents. When an incontinence product of any kind doesn’t fit it cannot offer the protection the wearer needs. Depend Underwear for Men Maximum Absorbency has breathable stretch panels that gently contour to your body for a close, comfortable fit. They are stretchy, soft and quiet-like real underwear so the man wearing them can be assured of both comfort and discretion. Finally, the leg openings are cut in a way which better fits a man’s body. Since 2004, The Caregiver Partnership has been helping people just like you. Unlike the big box stores which usually only offer 3 brands of incontinence products, The CareGiver Partnership shops the world over to find the best incontinence products - those used by consumers and professionals alike. They offer over 733 choices which is ten times more brands, styles, sizes and absorbencies than even the big box stores. And, they have knowledgeable Product Specialists you can speak with when you call 1-800-985-1353.